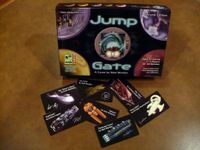 The "Funagain special limited release" is the version of the Second Edition of "Jump Gate" that can only be purchased through Funagain.com. It includes all of the original game components as listed on the box, plus 7 additional spaceship cards and 6 additional card stands not found in the other versions of the Second Edition. The cards and stands work together to represent each player's position marker in the game in place of the original "rocket pawn".